Several years ago, my son and daughter-in-law found themselves in a cold and sterile infertility clinic 1500 miles away from home. They desperately wanted a baby, but things didn’t happen the way they had planned. After all attempts to conceive had failed, they flew home with shattered dreams and lost hope. Their story is heart wrenching, and it’s shared by more than 6 million couples in the U.S. who just want to have a child. Proverbs 13:12 says, “Hope deferred makes the heart sick, but a desire fulfilled is a tree of life” (ESV). Whether it is hoping for a child, a career promotion, or that special someone to share our life, it’s only human to want things to fall into place. We pray and plead and weep, wondering if God hears us. Our well-meaning friends quote Bible verses for us. We read and reread God’s promises. But when what we hope for is deferred, it truly does make the heart sick. During a season of waiting, bitterness can take root and hopelessness can overwhelm us. We ask questions and wonder why, but the answers don’t always come. In Psalm 40, King David says, “I waited patiently for the Lord; he turned to me and heard my cry. He put a new song in my mouth, a hymn of praise to our God” (40:1, 3 NIV). Waited patiently. Two words that tell us what David did in his time of distress, and that God heard his cry. But I wonder how long David had to wait before God responded—one week, two years, or a decade? The Bible doesn’t say. Waiting patiently for something our hearts long for is physically and emotionally exhausting. It consumes our thoughts and can make us feel weak as we attempt to go on with our daily lives. The prophet Isaiah offers encouragement with these words: “Those who hope in the Lord will renew their strength. They will soar on wings like eagles; they will run and not grow weary, they will walk and not be faint” (Isaiah 40:31 NIV). When our hope is in God, rather than in doctors or bosses or dating websites, he renews our strength. His love and grace and mercy are great enough to cover our shattered dreams, heal our broken hearts, and restore us to wholeness. My son and daughter-in-law were finally blessed with baby boy, and three years later a baby girl. They now have a noisy home with scattered toys on the floor and fingerprints on the windows. Of course, not every desire or hope we have will be fulfilled the way we want, and only God knows how each person’s story will be written. But while we wait patiently for his plan to unfold, we can soar with the eagles knowing that God will answer our prayers in his time and in his way. About the author: Crystal Bowman is an award winning, best-selling author of more than 100 books for children including Our Daily Bread for Kids, M is for Manger, and Does God Take Naps? She is a mentor for MOPS and teaches at writers’ conferences. She is a contributor to Clubhouse Jr. Magazine and writes lyrics for children’s piano music. 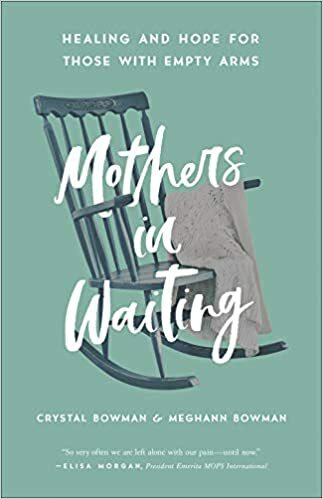 Her latest release, co-authored with her daughter-in-law, is Mothers in Waiting, Healing and Hope for Those with Empty Arms. She lives in both Florida and Michigan (wherever the weather is best), and travels often to get hugs from her grandchildren. Join the conversation: For what are you waiting? It is hard to say. When I felt too afraid and not capable enough to go on with medical school all my life went on a roller coaster. Ashamed to not be judged as stupid by high school elite colleagues I went on with a university (informatics and programming) I never quite liked. And struggled. And worked a bit in that field. Now I am trying to begin a new road, simpler, more woman like and honestly I wait for some normality in my life where I can say I understand something out of what happens, I know a bit of God, I am in good terms with Him and my destiny and that I feel I have a future. When there is so much suffering around, I wait patiently for God’s goodness and peace to come. Otherwise life is too wicked to make sense. Thank you for sharing your personal struggles. I pray that God will guide and direct your paths as you trust in Him.